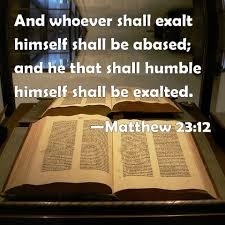 "Whoever exalts himself shall be humbled; and whoever humbles himself shall be exalted"
Pride is horrendous. St Augustine says, “It was pride that changed angels into devils.” Through pride we become arbiters of truth. And as Malachi points out, the teaching of false doctrine leads the whole community to profane the covenant relationship with God. No wonder Jesus warns against false teaching and the fate of the arrogant Pharisees, adding that “Whoever exalts himself shall be humbled; and whoever humbles himself shall be exalted.” In our own Archdiocese this vice, pride, has led to the rejection of the doctrine that Jesus descended into hell. In our school the Immaculate Concession has replaced the Immaculate Conception. Also, we now pray for Saints. The rebellion of pride does not seek authoritative teaching, but rather hates it. Pride is insidious because it is deceitful. Pride so flatters a person that they fail to detect and detest their sin (Psalm 36:2). The deceit is first, their own. Then, with no fear of God and a distorted worldview, they become malicious and deceitful towards others (Psalm 36:3). According to St. Bernard of Clairvaux there are 12 escalating steps of pride that begin in the mind, develop into behaviors, and then harden into attitudes. Ultimately, pride becomes a habitual sin. (1) Curiosity – There is such a thing as healthy curiosity but often we also delve into things we that we think we have a right to know: other people’s affairs, private matters, and so forth. Prying, meddling, and looking into things we ought not, is fertile ground for all manner of false beliefs that lead to self-deception, and reasoning based on our construction of the truth. Genesis teaches us that knowledge is revealed and not to be taken. The stimulation of curiosity led to the original sin. (2) Levity of mind – This is when we overly occupy our mind with things that are not appropriate. For example, we spend hours watching TV but have little time for prayer. Levity of mind is the brushing aside of what is important to God and the substitution of our own foolish priorities. (3) Foolish merriment – Levity of mind leads to the frivolous behaviors. Again, we find all the time for frivolities but no time for discipline, for prayer or study of Holy Truth. (4) Boasting (actual self-deception) – Locked into our little world of a darkened intellect and foolish behavior we boast of foolish things, thinking of ourselves more highly than is true or reasonable. We forget that what we do have is a gift of grace to instead construct an idol to our self. (5) Singularity – Treating our self differently to the way we treat others, claiming to have special rights. For me it’s different. In my singular case the rules don’t apply. This thinking is prideful, leading us to become a law unto ourselves. For example, our PA system has a sign asking no one to change the settings. That doesn’t apply to one person who has placed themselves above that order. (6) Self-conceit – Having an inflated image of themselves, they form unduly high opinions of their own abilities and worth, whilst looking down on others. The proudhearted believe they are infallible. They are always right and can never be wrong! They won’t listen or take instruction. (7) Presumption (a sin against hope) – Pride leads to the presumption that salvation is granted and due to ‘me’ no matter what ‘I’ do. (8) Self-justification (deadly sin) – An egotistical way of thinking that gives individuals the sense that they are justified doing anything they want. Always concluding that their behaviour is justified, they always think they are in the right! Seeing good in everything they want and do, getting what they want is what represents justice to them. And having justified to themselves everything they do, they refuse to be accountable to anyone, even to God. (9) Hypocritical confession – Playing the part to look holy if the applause from the audience is forthcoming. No contrition, no amendment, no penance! (10) Revolt – Pride leads to outright revolt against God and his representatives (think of SSM). To revolt means to renounce any allegiance and abandon any sense of accountability or obedience to God, to his Word or to His Church. Revolt is the prideful refusal to be under any authority. (11) Freedom to sin – The prideful person increasingly rejects any restraints or limits, arrogantly asserting their freedom to do whatever they please. (12) The habit of sinning – We see pride’s full and ugly flower: habitual sin and slavery to sin. The scary thing is that prideful people are oblivious to their pride, oblivious to their sin (Psalm 36:2). Pride is killing us. It starts in the mind through curiosity. It is alluring, tempting us to self-flattery. When we first allow ourselves to be deceived, we swallow the lie. Our behaviour changes, we become more arrogant, our hearts coarsen. The purpose of this homily is to extol the opposite – to extol the virtue of humility. St Augustine did say that, “It was pride that changed angels into devils” but also that “it is humility that makes men as angels.” He championed humility as the foundation of all virtue stating that where humility does not exist there cannot be any other virtue except in mere appearance. Let us humble ourselves before God and submit to the true teachings of the Gospel.